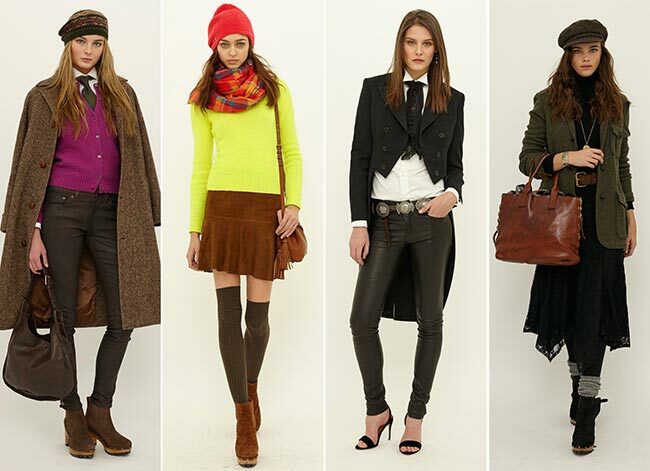 The Polo by Ralph Lauren fall/winter 2015-2016 collection brings diversity and a casual style in an effortless manner. We witness a range of comfy and chic pieces with the peculiar preppy attitude, which are so easy to mix and match into statement-making looks. From cozy and stylish outerwear pieces to everyday dresses, tops and pants, there is everything one needs to see the upcoming cold days in a cool style. We have some gorgeous accessory pieces as well, particularly iconic Ralph Lauren hats, spacious handbags, printed scarves and platform shoes in suede. With his new youthful collection, the American designer manages to cater to the cold season fashion needs of women with different tastes, preferences and occupations. The debut line of the Polo branch of the fashion house was launched only last season and with the new collection we can already see its rapid development. Diversity is the best word to describe the Polo by Ralph Lauren fall/winter 2015-2016 collection, which brings both neutral and bright colors, long and short lengths, preppy and classic styles. Talking about the former, we should mention the fall-ready shades of black, dark green, brown, cream, khaki and wine red, which are mixed with pops of neon lemon, bright fuchsia and orange. In addition to the monochrome looks playing with interesting textures, we also see lots of plaid, touches of camouflage and ethnic vibes, little floral patterns and elegant pinstripe motifs used for a number of office-ready pieces, like the perfectly tailored boyish pants with suspenders or the pantsuit with a cool vest. The collection opens with a darker mood, where checkered coats, cozy knits and black pieces are the protagonists. We see the comeback of black leggings for the new season, which are matched with skirts cut at different lengths to give warmth and a youthful vibe to the looks. Immediately after this range of pieces, we discover the bright pops of neon colors used to jazz up the brown suede and leather looks, as well as the monochrome black designs. Apparently, leather and suede are huge for the upcoming season according to the Polo collection of Ralph Lauren, used both for the pants and skirts, as well as the chic footwear styles and bags. After a couple of black and white boy-meets-girl tuxedo dressing, the collection goes cozy and monochrome bringing head-to-to cream looks featuring hand-knits, suede and lots of fringing. We also love the warm shearling coats and the suede boots with fringe details, as well as the knitted beanies and chunky scarves that will definitely protect us against the harsh cold weather at the same time adding to the chic of the outfits. The finale of the collection is again in black tones, where we can spot some tiny floral patterns used for two short-sleeved dresses. If not the gorgeous trends and styles available, then the wearability factor is one big reason why the Polo by Ralph Lauren fall/winter 2015-2016 collection is going to be a huge success in the upcoming cold months.